The OnePlus 7 is the next in line smartphone we are patiently waiting for. This time around the phone will be coming with OnePlus 7 Pro which will be the bigger model. The good news is that the date of the launch event has been scheduled which will take place on May 14. According to Onleak, the renders show that the phone will be notch-less. It will ditch the notch featuring a triple rear cameras set-up, and a pop-up front camera. This should not surprise us, besides it’s the first time OnePlus want to introduce the pop-up front camera and triple rear cameras as well. So the handset will be bringing new things to the tablet. 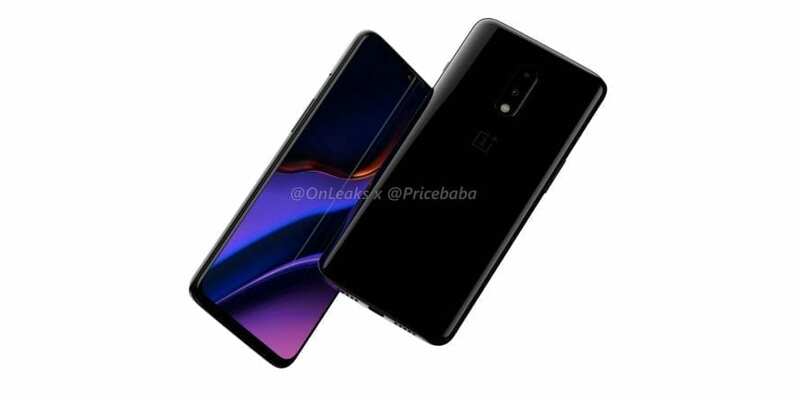 That outside, the Leak by an Indian publication shows that the OnePlus 7 will be coming with a style notched display similar to the OnePlus 6T coupled with combo rear cameras. This means there will be major differences between the OnePlus 7 and the OnePlus 7 Pro. Thanks to Onleak as they have taken their time to share some difference between the two phones on Twitter. The OnePlus 7 will feature a screen display size of 6.4-inch with a water drop notch. The device will come with a vertically placed dual camera on the panel that will consist of 48-megapixel primary lens. It will be equipped with a display fingerprint reader. The OnePlus 7 Pro will be featuring a notch-less screen display size of 6.64-inch. It will have a pop-up front camera, while on the back, it will be blessed with triple rear cameras of a 48-megapixel primary lens, a telephoto sensor, and an ultra wide-angle camera. There will be an in-display fingerprint sensor on the device as well. The OnePlus 7 5G will be the special edition of the OnePlus 7. The 5G will likely be the OnePlus 7 Pro in terms of design but will feature a 5G network on the inside. Just like the Galaxy S10 5G, the only difference will be the X50 5G modem. The OnePlus 7 series will be official on May 14. The smartphone will be priced starting from $599. The OnePlus 7 Pro is expected to cost between $699 and $749, while the 5G Edition will jump to $899. Other details concerning the phones will be made available in the coming weeks.